Dilly beans are green beans, suspended in a vinegar-based pickling liquid and seasoned simply with garlic, black peppercorns and either dill heads or seeds. Because beans are sturdy little suckers, they retain their crispness through the boiling water bath process. 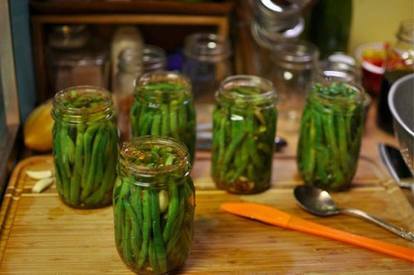 Even months after canning, dilly beans will be crunchy and intensely flavorful.